I have been apprehensive to write this journal entry. I am going to touch on politics, and that is something I am loath to do in a public forum. I am a very proud, patriotic American, and the deep political divides in this country pain me. I have chosen to move forward, however, with courage and the hopes that my few readers will bear with a view that may differ from their own without hatred or attack. Pat Barker’s Regeneration deals with the recovery and regeneration of World War One English soldiers with post-traumatic stress disorder (then called Shell Shock) at a mental hospital called Craiglockhart. I have experiences with PTSD, but I think I will write about that in another entry; after all, Regeneration is the first novel in a trilogy, and the other two novels are on ‘The List’. Barker interweaves fact and fiction in the novel: Craiglockhart War Hospital was real, as were the main characters Dr. W. H. R. Rivers and Siegfried Sassoon. The novel begins with a cannonball: a decorated soldier, Sassoon, has submitted a declaration of objection to the war and his refusal to take part in it any longer. The letter has been published in the London Times, and has received a great deal of attention. Unsure of how to deal with his declaration, the ‘powers that be’ send Sassoon to Craiglockhart for an examination of his sanity. Many people objected to the military actions in Afghanistan and Iraq over the last decade. Some went so far as to call the wars ‘immoral’. I think that it is difficult enough to examine the morality of a person’s daily decisions, much less the morality of an entire war. Counter-terrorism and foreign policy issues are extremely important to me; when I vote, at least 51% of my decision is based on these issues. After my experiences on September 11, 2001, I doubt that anyone could blame me for this choice (except, of course, for the ideologues). I fully support the Bush administration’s decision to invade Afghanistan and Iraq. I truly believe that the United States is safer because of our military intervention overseas. Whether or not all the facts were clear before the invasions, whether we are much safer or only slightly safer, whether it was moral or immoral are questions that I will leave to the many talking heads on cable networks. At the very least, it is clear that these were hugely humanitarian efforts; the people of both countries are far better off with democracy in place rather than murderous dictators. I also fully support the Obama administration’s covert invasions of Pakistani areas to eradicate Al-Qaeda cells, and especially Osama bin Laden. It is interesting to me, however to compare the two approaches. On the one hand, the Bush administration used a multilateral coalition invasion of enemy countries, whereas the Obama administration has used frequent covert, unilateral raids in an ally country. There is no question that President Bush could have ordered unilateral strikes into Pakistan to eliminate terrorist cells, and probably even Osama bin Laden; the technology and force were certainly available. Bush believed that diplomatic relations with Pakistan outweighed the risks of invading a tenuous ally in the volatile Middle East; only after seven years of diplomacy did Bush begin to work with the Pakistani government to request raids and ground skirmishes on the Afghan/Pakistani border. Despite the many, many characterizations to the opposite, it seems that President Bush was a diplomat and that President Obama is a cowboy. This is not a criticism, just an observation; I am a fan of diplomats and cowboys alike. The Bush administration’s hope was that democracy in the Middle East would spread like wildfire- that upon witnessing democracy in Israel, Iraq, and Afghanistan, other Middle East countries would overthrow despotic dictators and insist on democracy. I thought this was a very quixotic view when it was announced. Amazingly, the last few years have seen exactly this situation: in Egypt, Syria, and Libya, the people have fought or are fighting to overthrow oppressive dictators and install democracy. The actions of the Obama administration in Pakistan remain to be seen. A nuclear Pakistan would make a very powerful, very dangerous enemy to the United States. I hope that our relations have not been damaged beyond repair. From what I understand of World War I, it was the most immoral war fought in the western world in modern times. It was the first time that modern technology played a role in warfare, and gas warfare was so horrific that it became outlawed after the war at the Geneva Convention. The war was based on centuries of prejudice, misunderstandings, and militarism. Unlike the recent wars in the Middle East, World War I did not end tyranny or oppression; it merely set the stage for the rise of fascism and communism and World War II (a war which did indeed end tyranny and oppression). The ‘fog of war’ precludes us from seeing what long-term results will come from our military actions in the Middle East; we can only hope that we follow the important lessons we have learned from the mistakes of World War I and the triumphs of World War II. Novels like Regeneration are important reminders of these lessons. By the end of the novel, Sassoon is even more adamant about his declaration of objection, and rightly so. 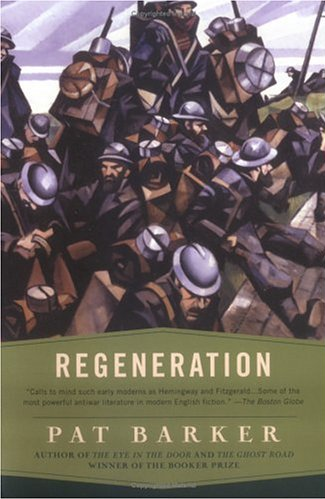 Regeneration should be required reading for all U.S. military leaders. Mom- Not sure you would like this book that much. You are certainly welcome to give it a try, if you like. Thanks for the comments! Maybe it’s the motivations behind the wars that are immoral? I wonder if any motivation behind any war is immoral. I guess it’s a necessary evil. Peace is wonderful, but we have to protect ourselves from dictators.